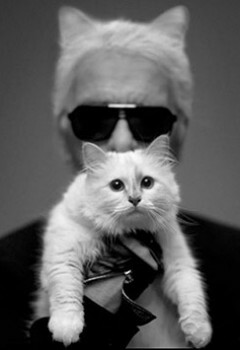 Choupette (born August 15, 2011) is the pet feline of Karl Lagerfeld, head of design and creative director at Chanel. Originally belonging to the French male model Baptiste Giabiconi, Choupette was given as a gift to Lagerfeld around Christmas 2011 following a stay with the designer while Giabiconi was abroad. Choupette’s likes include her two maids, private jet, and kneading vintage Chanel and her dislikes are mini humans and nonconsensual petting. Our hearts go out to Choupette and the family of the late Karl Lagerfeld.